Whether you're just beginning a new hobby or are experienced in the art of needlepoint, there's no shortage of lovely patterns to buy. In addition to the patterns you can find in your local craft store, designs and kits abound from a variety of Internet retailers and book sellers. Internet craft stores and needlepoint specialty shops sell patterns by famous designers, relative unknowns, and everyone in between. You'll find nature-inspired images as well as cute cartoons, touching sentiments, holiday patterns, and more. The following retailers specialize in needlepoint patterns. 123 Stitch sells needlepoint patterns by designers like Needle Delights, Deb Bee, Northern Pine, and Laura J. Perin. 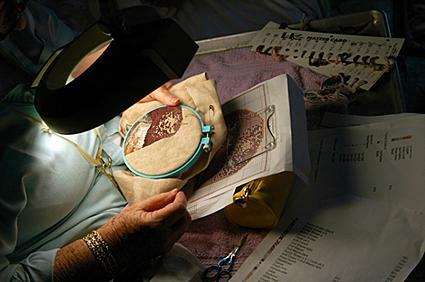 Many are very ornate, and some are inspired by famous quilting patterns. You'll also find Celtic knots, landscapes, and holiday designs. Prices range from about $3 to $10. You can also buy tools and materials to complete your project. 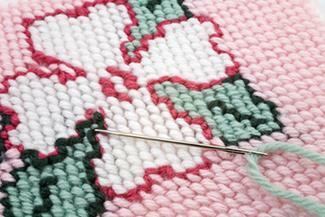 Past Times Needlepoint is a Texas-based retailer specializing in all things related to this popular hobby. If you're looking for a great selection of patterns, especially whimsical or animal-themed designs, this is a great place to shop. You'll find patterns from popular designers like Point of It All, Birds of a Feather, and Anne Brinckley. There are dozens of holiday patterns for Christmas trees, Santas, and more, as well as cute samplers and scenes. Prices vary based on the size and complexity of the design, as well as the designer, but expect to pay between $25 and $50. You can also purchase supplies at this site. The Needlepoint Shop has a huge selection of needlepoint kits. Since these patterns include thread, they are a bit more expensive than patterns that don't come with supplies. You'll find equestrian designs, Asian motifs, floral patterns, and more. There are also kits for making bags, belts, Christmas stockings, and other items. Designs tend to be very elaborate. Prices range from about $60 to over $600, and orders over $100 get free shipping. Looking for something a little more modern? ZIVA Needlepoint Designs is a unique needlepoint shop created with the modern woman in mind. You'll find graphic patterns for everything from cuff bracelets and clutches to rugs and table runners. Everything is very stylish and contemporary at this European needlepoint boutique. The patterns include the canvas and appropriate needle. Prices range from about $45 to over $200. Needlepoint Heaven has a good selection of needlepoint patterns for everything from religious designs to animal-themed pictures and holiday projects. You'll also find patterns for belts and other accessories. One of the most exciting things about this shop is their ability to create a custom needlepoint pattern for you from a drawing or photograph. There are also designs for kids. Prices for patterns without yarn range from about $70 to over $200. Pick something that is challenging but not too difficult. Keep your experience level in mind as you look at kits and patterns. Consider the cost of floss or yarn when you compare prices. Some patterns are actually kits and include everything you need, while others are just the design. Pay attention to shipping. Many retailers will provide free shipping if you purchase a certain amount of merchandise. Think about how and where you'll use the item when it's finished. This can help you choose a project that will fit with your home decor or wardrobe. When it comes to needlepoint patterns to buy there are hundreds of beautiful options. As you shop, you'll see everything from whimsical animal designs to elaborate art pieces. There are patterns perfect for beginners and those that will be challenging even for the most experienced needlepointer. Don't forget that there are many options for free patterns as well. Ultimately, the perfect needlepoint pattern for you is one that fits your budget and tickles your fancy.